I don't blog about craft projects all that often, if you have this post in your feed and didn't want it, then try my "tech" feed specifically rather than all of the blog posts (recommended as I will be blogging a few non-tech things in the coming months). Anyway, I love to make things, code or otherwise, and since I'm not travelling a lot at the moment, I have time to make things AND to write about them. 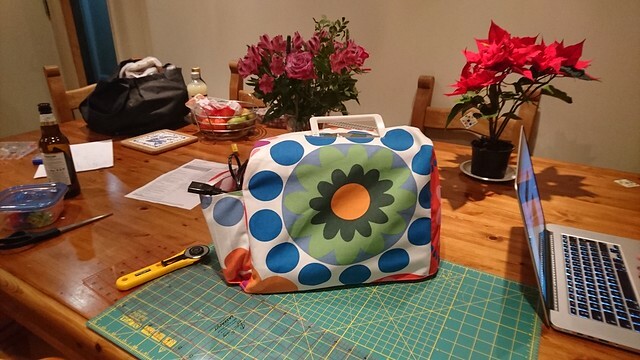 Today: my new sewing machine cover! This Christmas, a little girl in my life receives a play kitchen of her very own, handbuilt just for her. It was a fun project and I thought I'd share it (and the pictures, of course!). 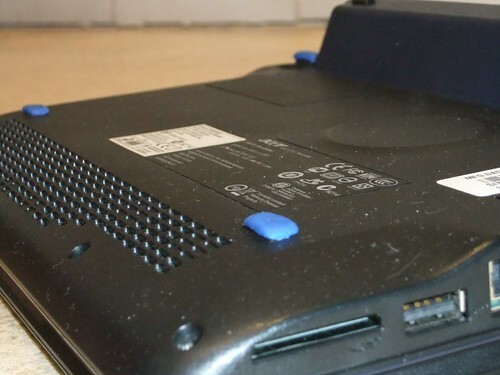 Sugru is like slightly toxic plasticene when you first get it out of the box, but it sets like strong rubber. In fact it was perfect for this, the finished feet feel securely attached and they're slightly squishy so they absorb the shock of me typing or the issues of a slightly uneven surface. Perfect! 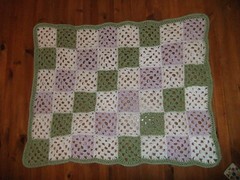 It's a very traditional granny square crochet blanket, I love these because I can take a ball of wool and a hook with me to anywhere and just make another square or two when nothing else is happening, but I never have to carry around the full project until I'm assembling it right at the end. 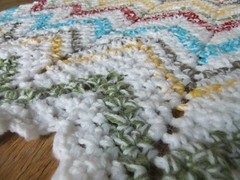 The border is one round of trebles and another of double crochet - as simple as anything! If you're reading my main blog feed, this post may take you by surprise - however at one time I enjoyed crafting and blogged about it often. Recently I've been finding more time for this, helped by the inspiring news of pregnant friends, so hopefully this is the first in a resurgence of craft-related articles. There are category-specific feeds if you'd rather only read the tech and/or php content. The cushions were 66cm so I cut two rectangles that were (66cm plus seam allowance) wide and ((2.5 * 66cm) plus seam allowance) long. Then I hemmed across the short sides (this was really fraying fabric, I should have overstitched everything before I started but I was too impatient!). They are simple envelope-backed cushions so I lay them on the floor with the right side up, folded the long sides at 33cm and then 99cm, basically you have a short end folded up and then the long end folded over that, with the seams showing. 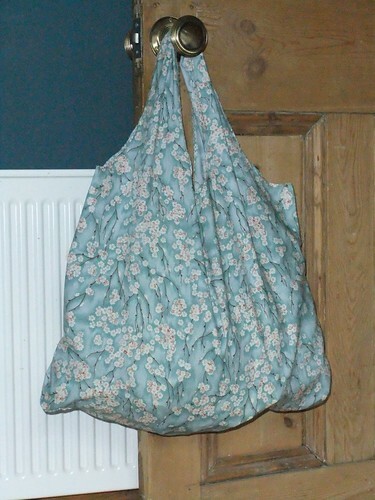 Then you sew up the sides and when you turn it the right way out - the short bit of the envelope is on the outside. Dead simple but they match the curtains and they are lovely and soft - the fabric is plain sheeting too so nice and comfortable even in bed! About a year ago I discovered the BurdaStyle site - where they have open source patterns. And then over the summer I saw an event organised in NYC where they were making these Charlie Bags - foldable fabric bags for putting shopping in. The pattern is free, and came as a PDF. You print the PDF, and then you cut and stick to make the paper pattern - the bag is bigger than A4. After around 15 months of ongoing work, I've finally finished my cobweb wrap which I initially started (original blog post here, complete with links to yarn sources) to make a good travel project. Well it was certainly that - small and lightweight, I took it on three transatlantic trips all told and am now so attached to it that I'm not sure when I'll wear it!